This fungus occurs worldwide. In North America it is especially troublesome in the humid eastern part of the continent. Beans develop round, black, sunken spots on pods and stems. Veins on leaf undersides turn black. Cucumber and muskmelon leaves develop yellow spots that dry up and fall out; spots on watermelon leaves are black. Infected fruits are covered with sunken spots with dark borders. 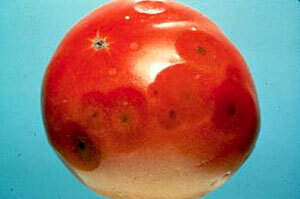 Tomatoes develop sunken spots on ripe fruits, the central parts of which turn dark. Wet weather encourages the disease to spread. The fungus overwinters in plant residues in the soil. Enriching soil with compost helps plants resist attack. Obtain disease-free seed and grow resistant varieties. Don't work with plants while they are wet. Irrigate with drip vs. overhead sprinklers. Rotate crops at least yearly (a 2- to 3-year rotation is better). Keep ripening fruits out of contact with soil. Copper fungicides are effective as a preventive when applied as directed on the product label. It's best not to depend too heavily upon this method of control, as copper can build up in soil to levels toxic to earthworms and microbes.